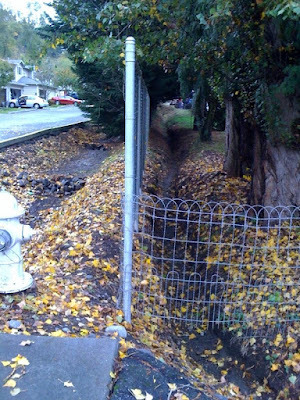 I was walking along 80th today and happened upon an interesting contrast in drainage ditch designs, conveniently located on either side of a fence. The one on the left side of the fence must have been part of the surface water management plan when this little cul de sac was built. Can you see the mounds of rock placed perpendicularly periodically along the ditch? I would imagine those are for slowing down the flow of the runoff a bit and helping silt to settle out behind the mounds. That ditch also appears to be gravel-lined. The ditch on the right is an interesting contrast. Just a steep-walled dirt ditch leading out to the ditch in the street. The bank is only a foot or so high, but still... Ideally, we would love to create a gradually sloping bank along this stretch of the stream (on the side away from our house). The Adopt-A-Stream Foundation came up with a plan and received a permit to do the work, but the grant funding ran out. Stay tuned - I won't give up hope yet. Meanwhile, we have the great large woody debris that was installed this summer with the help of The L.E.A.F. School, which will help stabilize the bank in a few places, slow down the flow a tad and help collect silt and small pebbles. We also have a bunch of live willow and red twig dogwood stakes stuck into the bank in the worst spots. As those grow roots, they will definitely help hold the bank together. Twitter updates - follow LilSwampCreek! 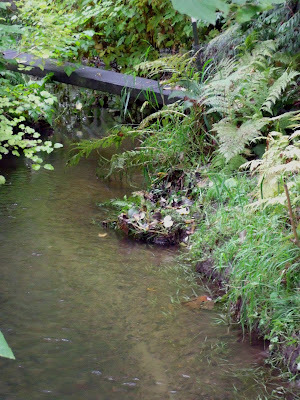 The restoration of this section of Little Swamp Creek was made possible in part by funding from grants from the Washington State Department of Ecology and the National Fish and Wildlife Foundation. This project would not have been possible without the amazing help of the Adopt-A-Stream Foundation and The LEAF School at Edmonds Community College.